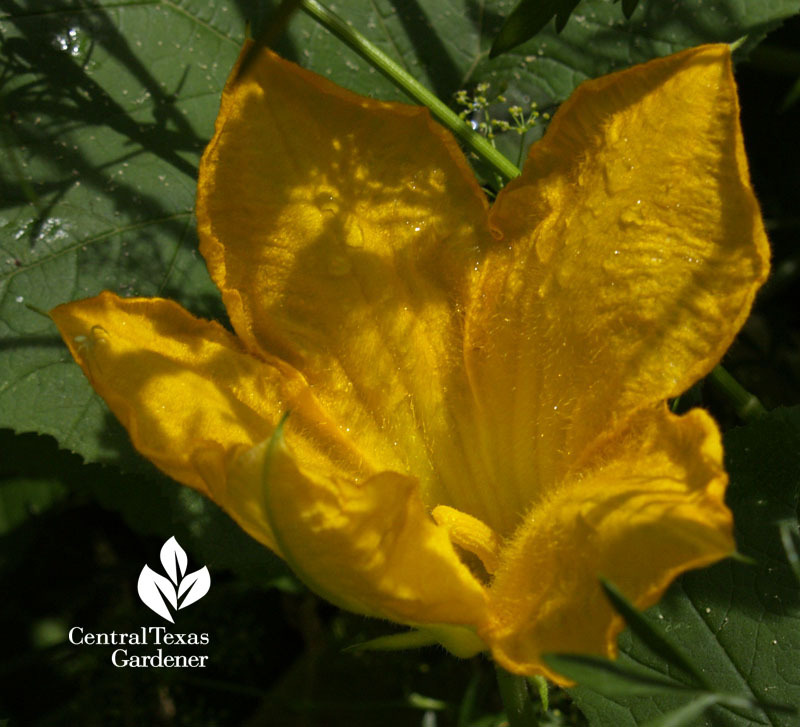 Daphne explains why lack of pollination is the culprit for members of the gourd family, featuring viewer Jeanine Starkenberg’s incredible video of how she and grandkids Brody and Piper pollinated their pumpkin patch. And, don’t miss outstanding hummingbird video sent by Rodney Rienfeld and Debora Dean. Right now, we’re digging a lot and pruning a little. Dull tools really take the edge off our enthusiasm! 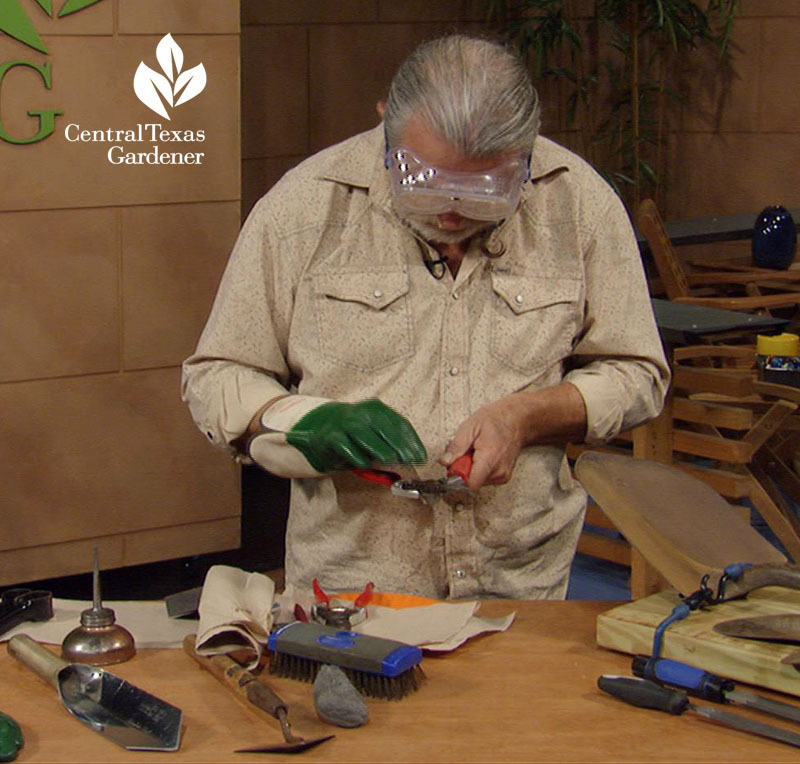 John sharpens our skills to remedy cranky tools. 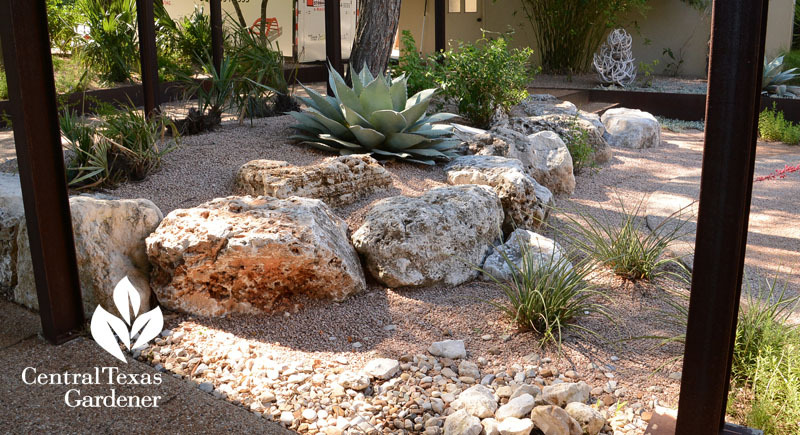 Are you between a rock and a hard place on planting for hummingbirds? 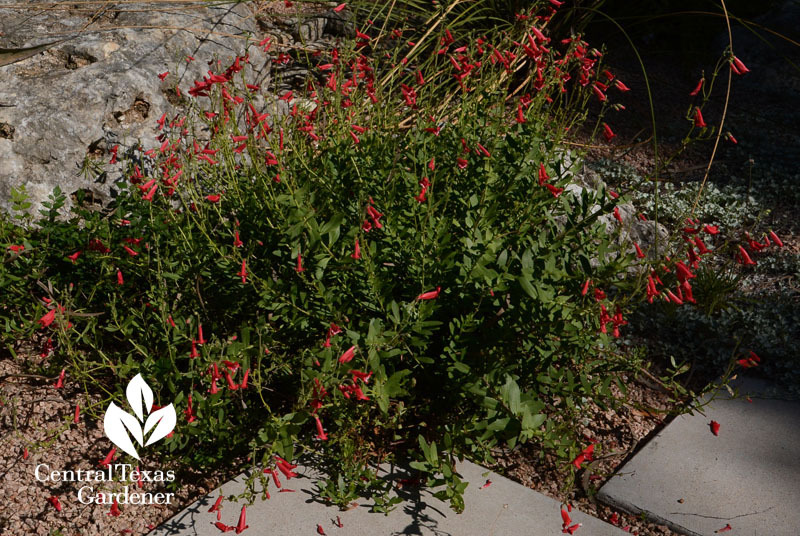 Well, native rock penstemon (Penstemon baccharifolius) is a small perennial that’s perfect for you. Daphne explains more. We’ve all got different soil, interests, and styles. What we share: lots of questions! 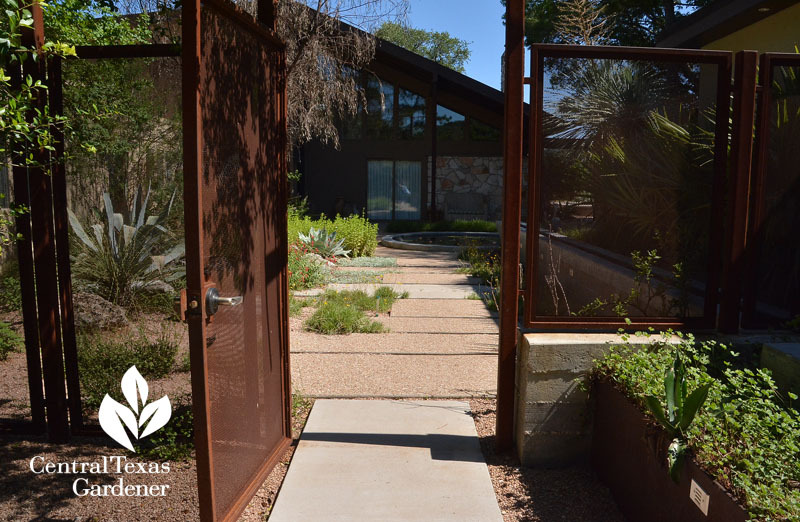 On November 4, the Austin Garden Conservancy Open Days tour has something for everyone, from plants to design solutions. 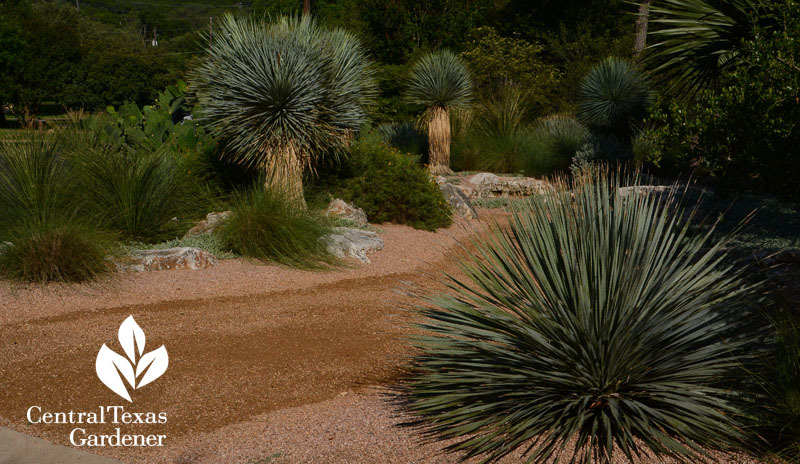 This week, Designer Patrick Kirwin spotlights the gardens, big and small, to captivate your imagination on heavy soil or rocky flood zones. Small-scale designs include one of designer’s Casey Boyter’s sustainable makeovers to blend architecture, nature, and her signature green roofs. 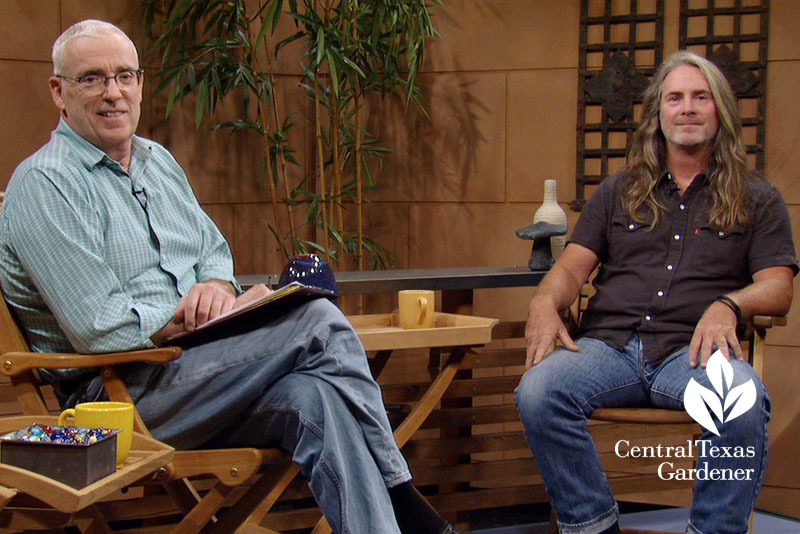 Watch CTG’s visit to Casey’s home garden here. 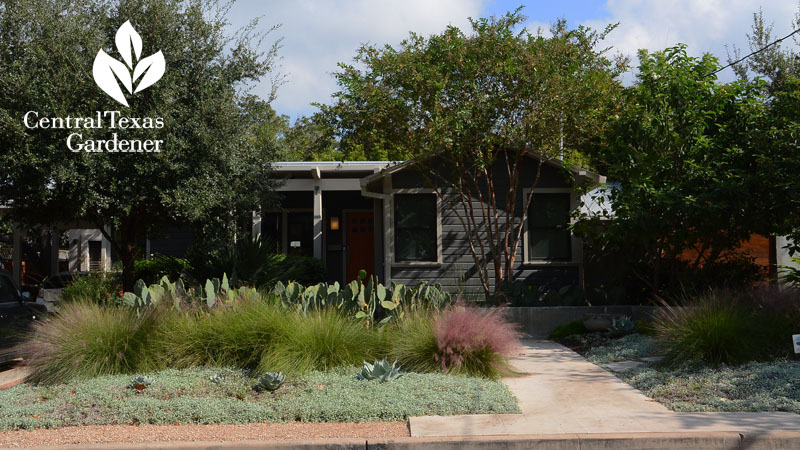 Designer’s B. Jane’s personal garden is another small footprint makeover in an older neighborhood, where she dropped dull foundation lines for engaging simplicity and serenity of space. The stunning backyard, with richly colored architecture and furnishings, is set for outdoor living with kitchen and shower! 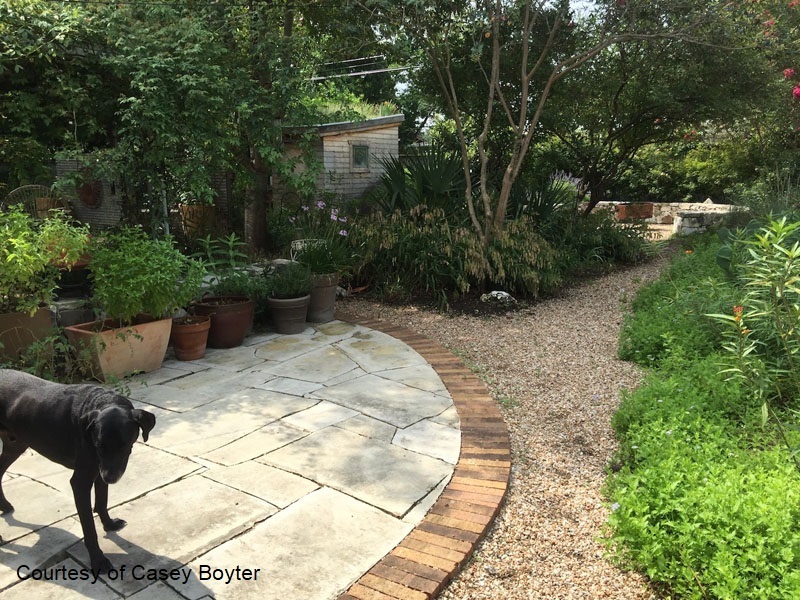 Designer Jackson Broussard also opens his recently completed home garden. 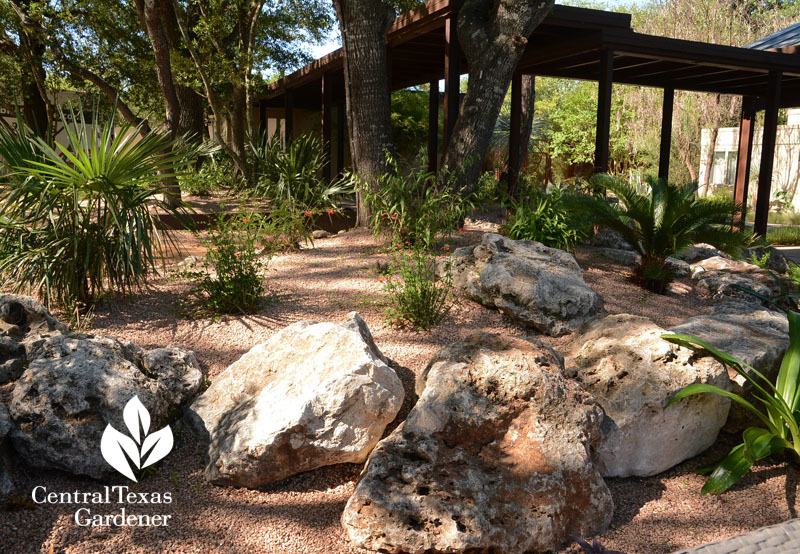 Jackson’s artistic touch blends architecture with easy-living plants to captivate wildlife and structural dimension. Here’s our visit to a garden he designed. 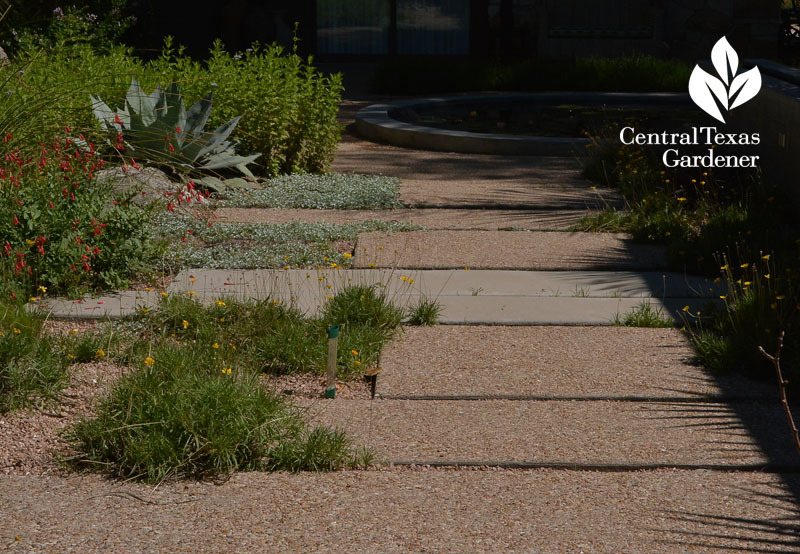 Landscape architect Tait Moring has been part of CTG almost since the beginning! 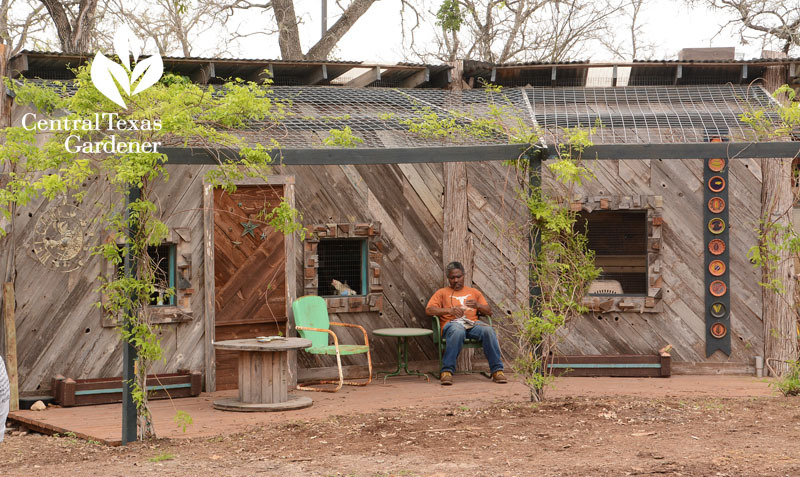 We’ve featured his home garden a few times, but you must see his latest renditions in person. 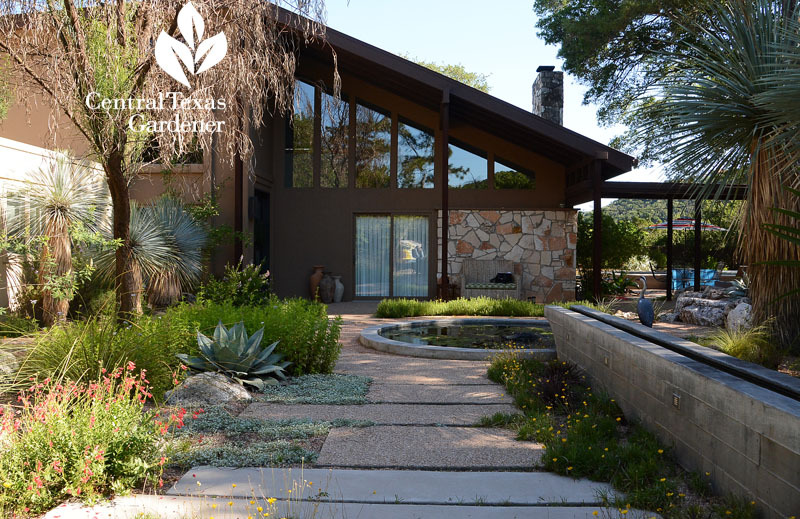 Wildlife and sustainable design has become increasingly more important to him, from outdoor living, vegetable gardens, and exquisite local stonework. Designer Annie Gillespie of Botanical Concerns has been a long-term friend and advisor to CTG, as well. We taped this garden a few years ago, but you must see its changes and how it’s filled in. 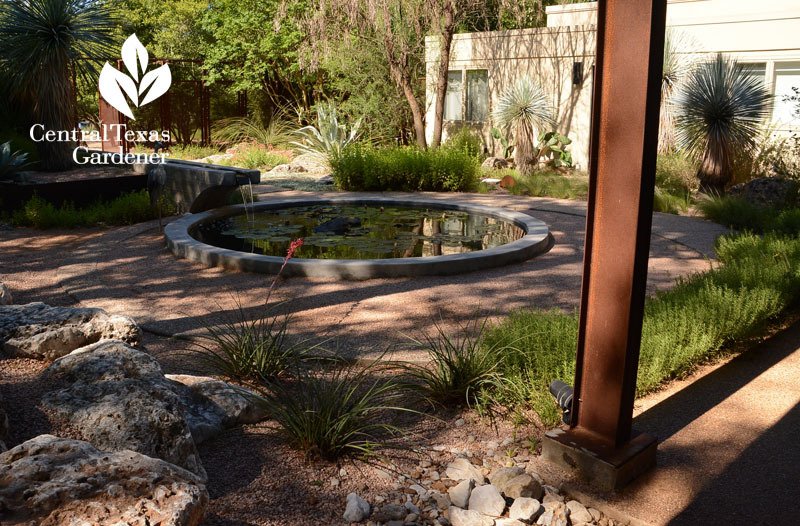 She and associate Rachael Beavers have incredible ideas for floodwater control, patio living, and native plants on rocky slopes. 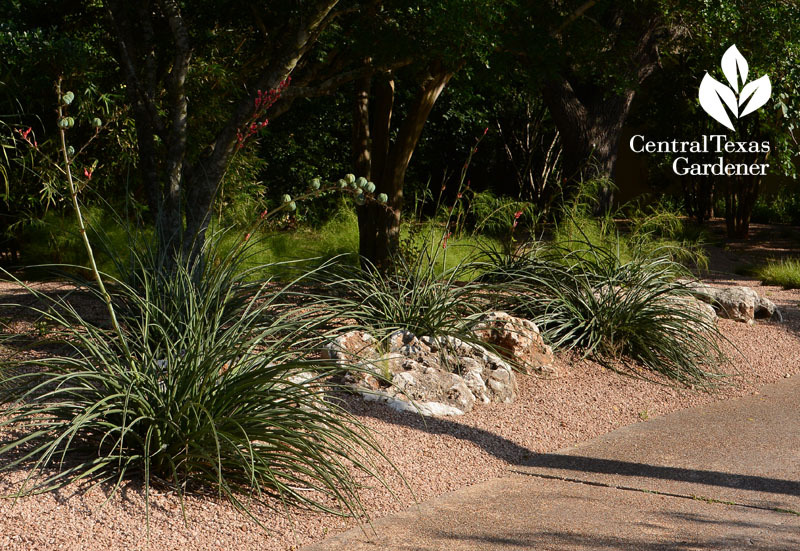 American Botanical Council is a public garden, but on tour day, you’ll have a chance to meet with their experts to explain how they grow medicinal and beneficial plants in a walk-around heritage landscape. I bet you’ve read about some of the plants they grow, but never knew how good they are for you! Here’s our video. We’ll be featuring the Community First! Village Genesis Gardens on November 18. On November 4, from 9 a.m. – 1 p.m., you really don’t want to miss this Mobile Loaves & Fishes’ planned community for the formerly homeless. This man lovingly tends the friendly chickens in their funky coop to supply free eggs to the community. 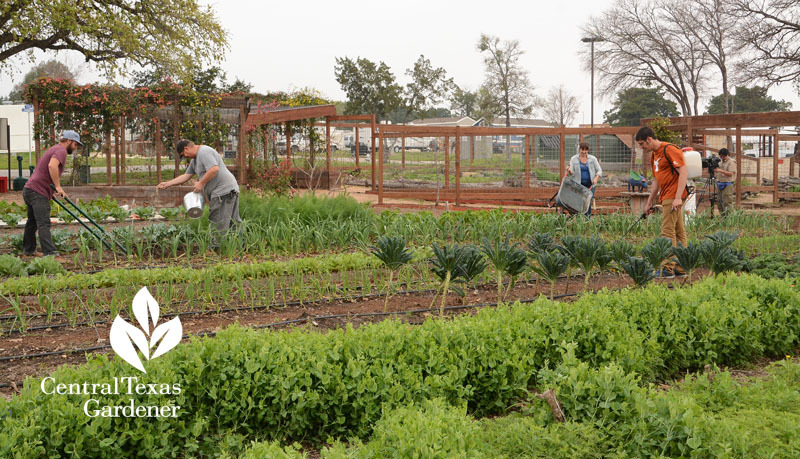 Along with rows and rows of vegetables, fruit trees, and berries, see their creative use of recycled materials to build garden structures. Watch now for Patrick’s inside scoop! And get tickets in advance right here. 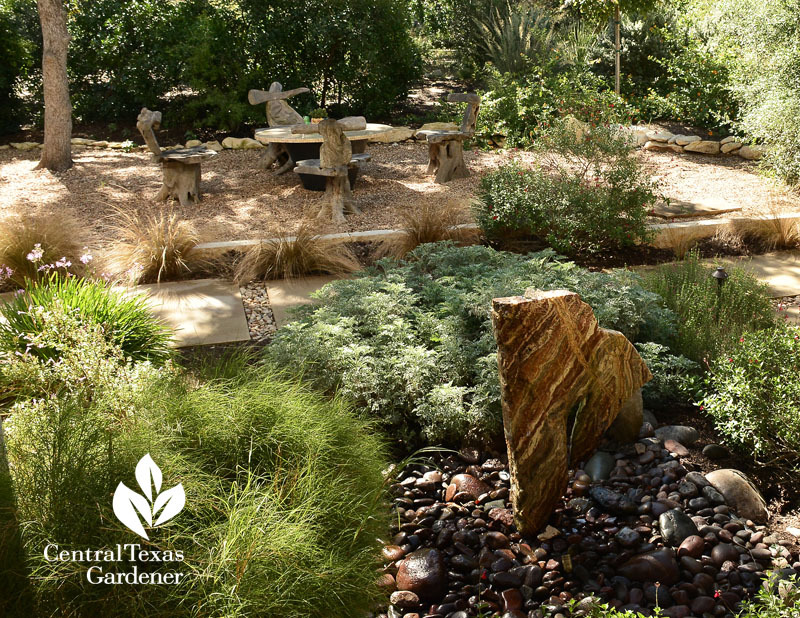 We headed out to the Lakemoore Drive garden where former homeowners Rhonda and David Watson banished lawn for wildlife support and habitat extension above Bull Creek. 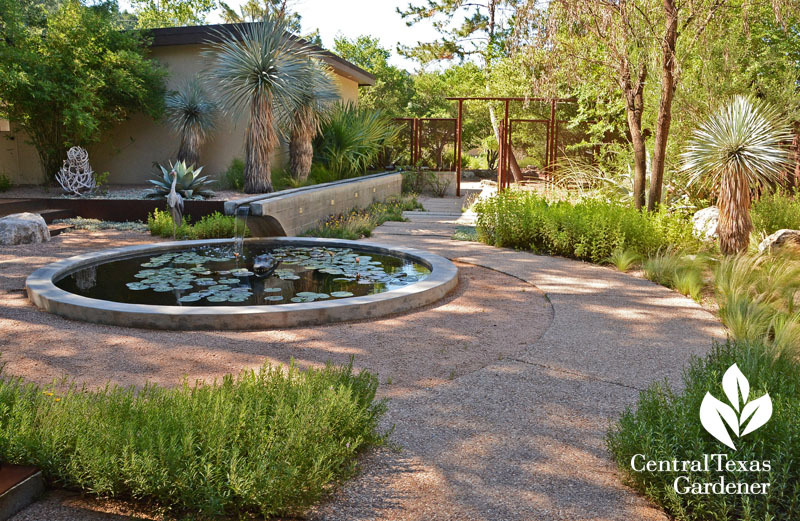 Contemporary meets naturalistic in an updated design by landscape architect Curt Arnette and landscaper John Gibson. A non-obtrusive metal mesh screen and gate separate browsing deer from interior plants. 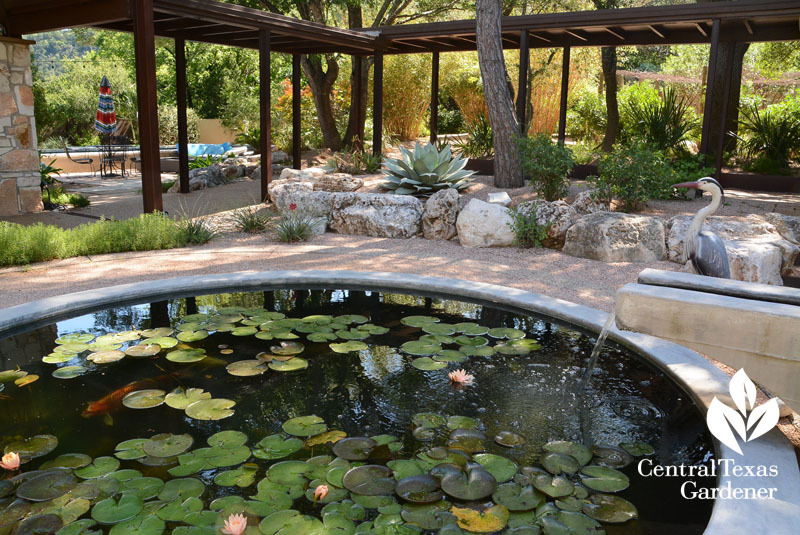 A small pool hydrates wildlife and starts the recirculating journey to the courtyard’s water rill. 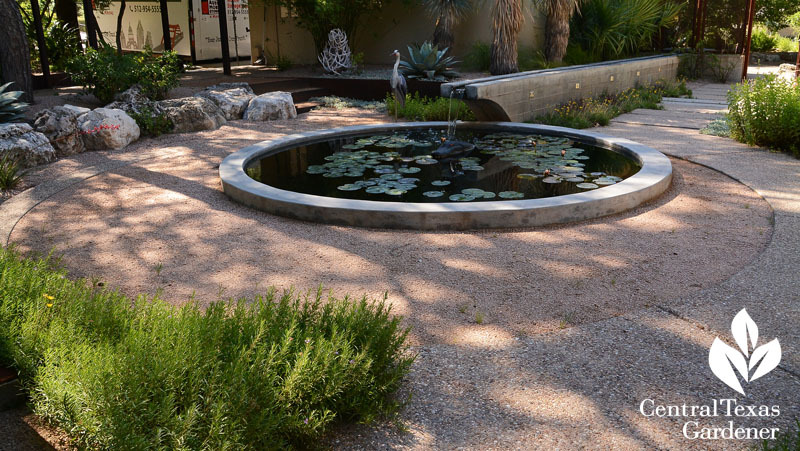 The rill’s design allows birds to safely drink and bathe. If lucky, they’ll hang out on your journey to the front door. Its gentle flow into a small koi pond masks traffic noise, where from the porch or inside, the Watsons watched their frequent flyers. 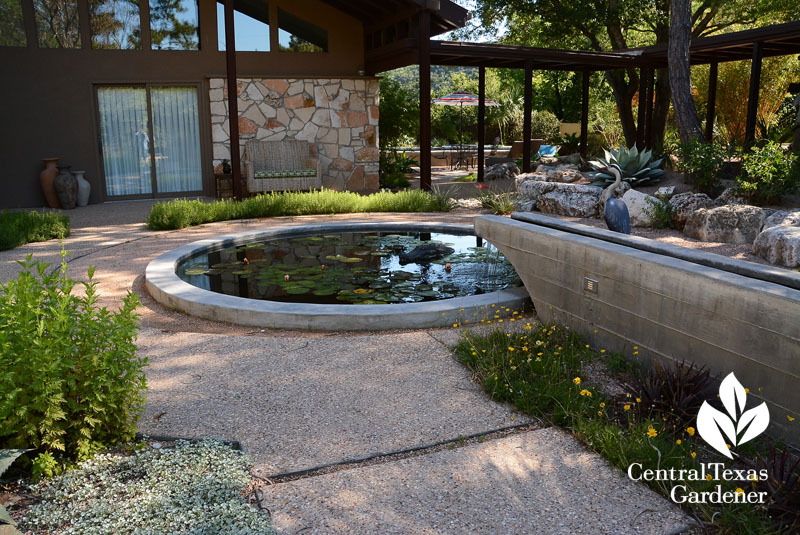 They wanted plants that required little water but that appealed to birds and pollinators. 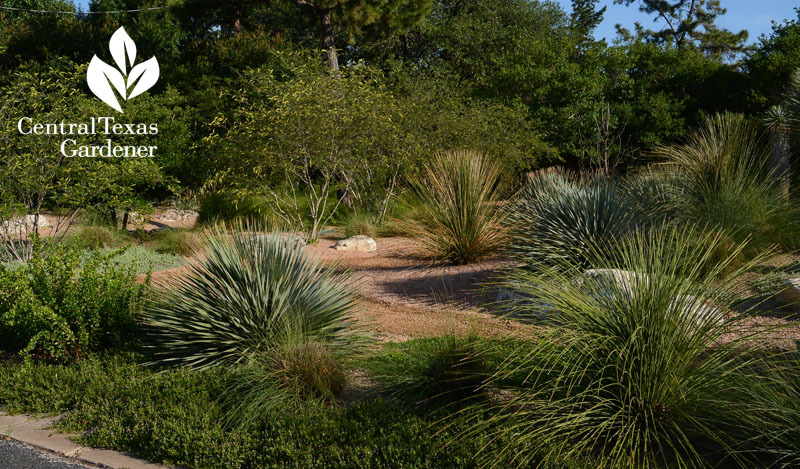 Curt and John layered small trees and sunburst Yucca rostrata with Mexican feather grass, perennials, agaves and red yucca. Native snake herb softens the lines of the porch, where its diminutive lavender flowers bring butterflies right up close. Strategically, they framed scenarios with boulders. 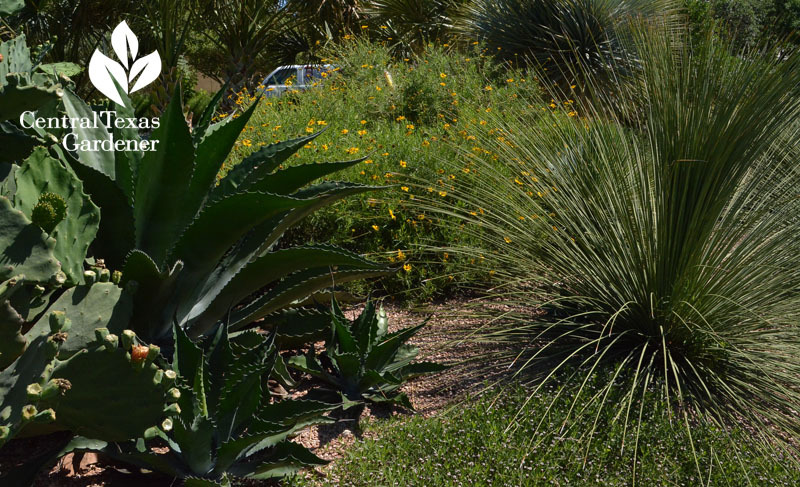 Here, blue Agave americana and Dasylirion longissimum pal up with hummingbird-lover rock penstemon and spilling silver ponyfoot. 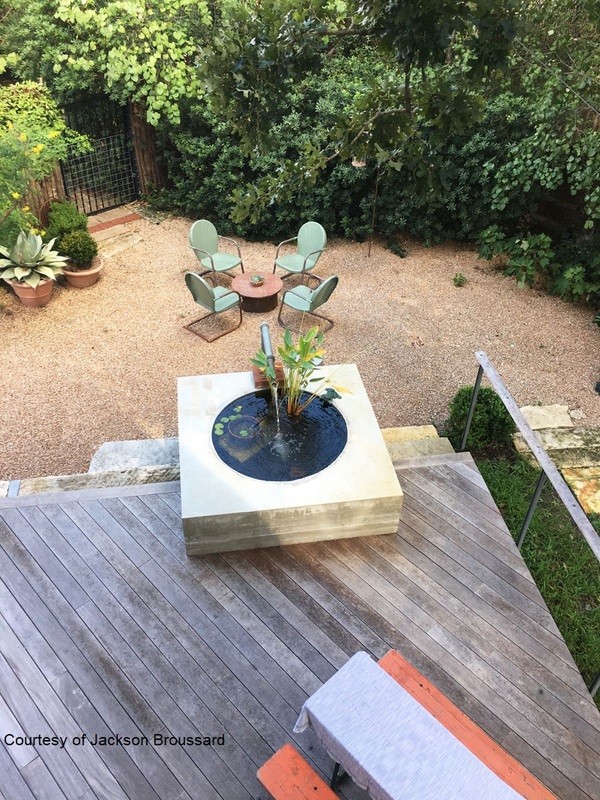 To step up textural diversity, Curt staggered repurposed exposed aggregate from the porch with new concrete. He offset angles with curves of decomposed granite. Opposite the flat house-side terrain, a boulder-edged berm uplifts the platform to signify courtyard enclosure. Beyond, a steel-beamed walkway to the garage frames the shady, woodland backyard, where Alfonse Karr culms and Japanese maple warmly glow. 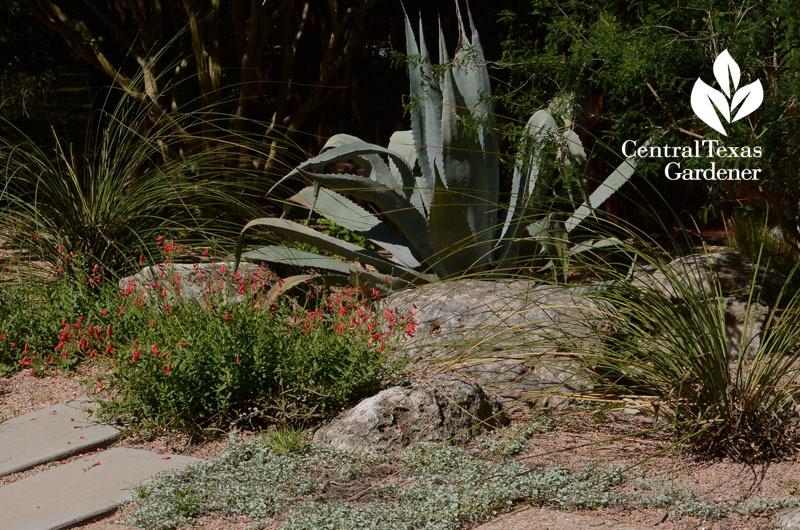 In back, berms mulched with granite gravel host young plants chosen for diverse height, texture, and form. 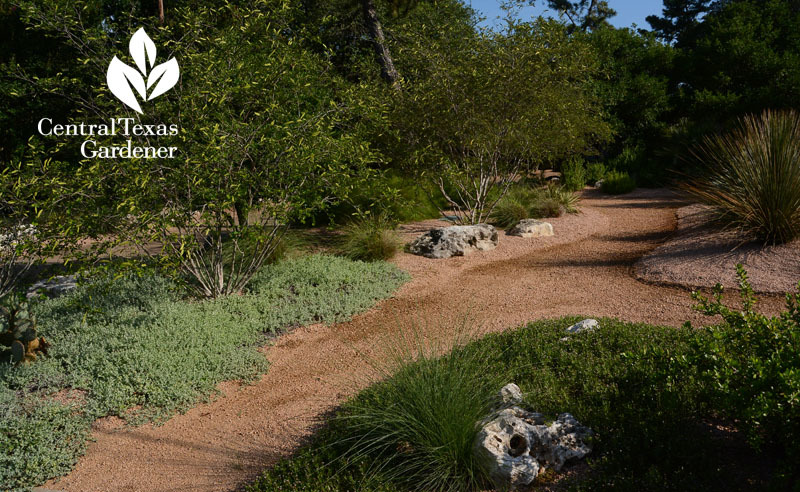 The berms allowed planting on limestone, improve drainage, and enrich dimension. 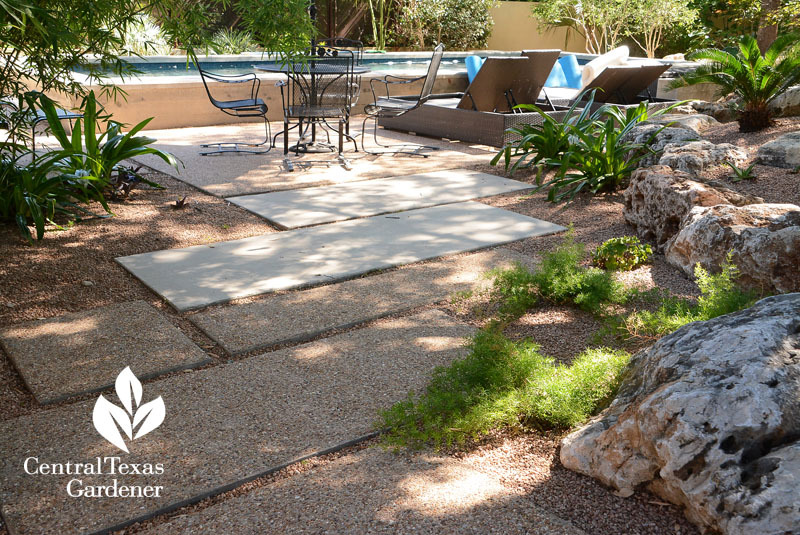 Aggregate and concrete pavers connect the courtyard to the family’s poolside entertainment. 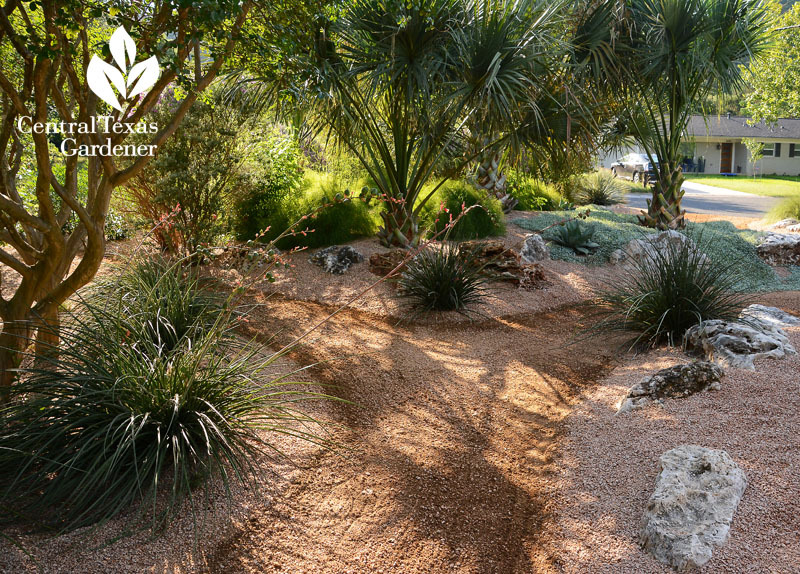 In front, red yuccas (Hesperaloe parviflora) and bamboo muhly meander along a driveway berm shaded by yaupon hollies and crape myrtles. 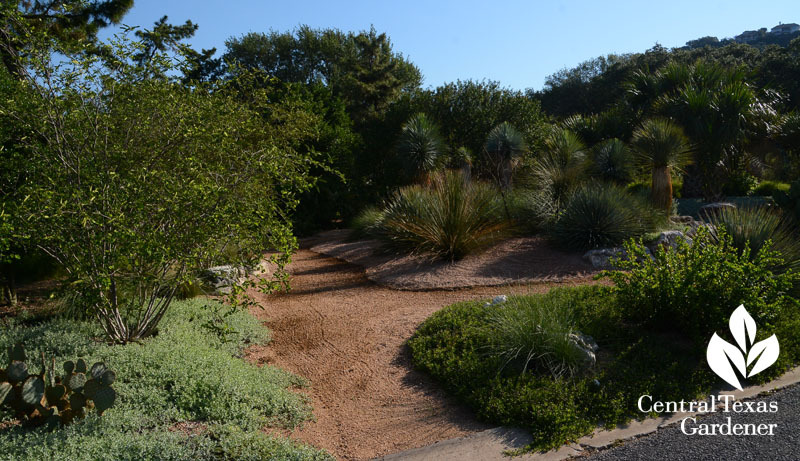 They banished dried up, flat lawn for dimensional destination trails of succulents, flowering perennials and shrubs to restore wildlife. When Rhonda and David’s days were filled to the max, they could literally take a hike in their own front yard to keep in step with nature’s unfolding cycles! There’s so much more, so watch it all now! ← Backyard native plant pocket prairie + hummingbird love!